Mr. G's musings: OMG.......where the pho-ck has PHO been all my life. OMG.......where the pho-ck has PHO been all my life. pho (phở pronounced [fəː˧˩˧] ( listen)). It is the most heavenly dish ever. I think it is the broth. Or, maybe it's the rice noodles.....or maybe it's the beef tendons. No, maybe it's the garnishes. All of these things together create the most amazing culinary experience. The broth for beef pho is generally made by simmering beef bones, oxtails, flank steak, charred onion, charred ginger and spices. For a more intense flavor, the bones may still have beef on them. Chicken bones also work and produce a similar broth. Seasonings can include Saigon cinnamon or other kinds of cinnamon as alternatives (may use stick or powder), star anise, roasted ginger, roasted onion, black cardamom, coriander seed, fennel seed, and clove. The broth takes several hours to make. For chicken pho, only the meat and bones of the chicken are used in place of beef and beef bone. The remaining spices remain the same, but the charred ginger can be omitted, since its function in beef pho is to get rid of the "cow's smell". Careful cooks often roast ginger and onion over an open fire for about a minute before adding them to the stock, to bring out their full flavor. They also skim off all the impurities that float to the top while cooking; this is the key to a clear broth. Salt, or preferably nước mắm (fish sauce) is added toward the end. Typical garnishes for phở Sài Gòn, clockwise from top left are: onions, chili peppers, culantro, lime, bean sprouts, and Thai basil. Vietnamese dishes are meals typically served with lots of greens, herbs, vegetables, and various other accompaniments, such as dipping sauces, hot and spicy pastes, and a squeeze of lime or lemon juice; it may also be served with hoisin sauce. 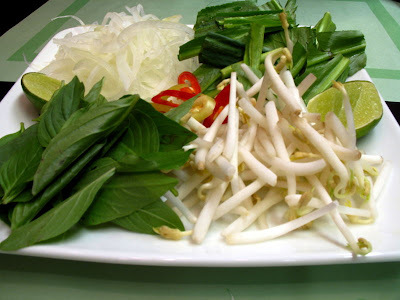 The dish is garnished with ingredients such as green onions, white onions, Thai basil (not to be confused with sweet basil), fresh Thai chili peppers, lemon or lime wedges, bean sprouts and coriander or culantro. Fish sauce, hoisin sauce and chili sauce may be added to taste as accompaniments. Several ingredients not generally served with pho may be ordered by request. 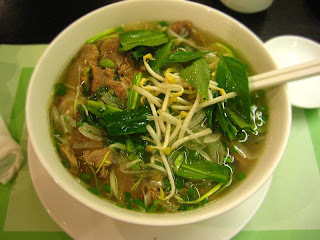 Extra-fatty broth (nước béo) can be ordered and comes with scallions to sweeten it. A popular side dish ordered upon request is hành dấm, or vinegared white onions. I have to thank my friend Zack for introducing me to this culinary experience. Where the phock have you been my entire life, Pho? ALSO, I just heard about the fires outside of your town. I hope you're not being subjected to the smoke.